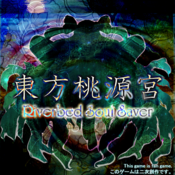 Touhou Tougenkyuu (Shangri-La Palace) ~ Riverbed Soul Saver (東方桃源宮 ～ Riverbed Soul Saver) is a fan-made Touhou Project script for the Touhou Danmakufu ph3 shooting game engine, programmed by ido (known for previous fangames The Last Comer and Mystical Power Plant) and Len (known for the fangame Phantasmagoria Trues). The first demo version was released on March 24, 2014, and the second demo on April 25, 2014, adding Marisa as a playable character. The full version with 6 main stages was released on June 27, 2014 and next major update on September 15, 2014 added an extra stage and Futo as a playable character. The most recent version, with the Phantasm stage and Overdrive mode, was released on January 31, 2015. The main gameplay mechanic involves a gauge that the player fills up by collecting items. Once full, holding down the bomb key will 'unlock' the player's full strength with a powered-up mode for a short period of time. Concerned that the recent influx from The Last Comer and Mystical Power Plant of newcomers to Gensokyo may put the Great Hakurei Barrier under too much stress, Yukari Yakumo has expanded the interior of the barrier into a pocket dimension to delay new arrivals. A massive amount of something is now approaching through the barrier, and bringing a cold front with it. Yukari sends Reimu Hakurei and Marisa Kirisame into the barrier's "Otherworld" to deal with this mysterious invasion before it can endanger Gensokyo. Riverbed Soul Saver features original music in the style of ZUN, composed by Wanwan. This page was last edited on 2 December 2018, at 05:52.